Usually, iMovie did work with .mov files. However, you will meet trouble in importing MOV to iMovie sometimes like unable to import MOV files from Nikon or Kodak to iMovie. This article will describe the reason why we often failed to import MOV video file to iMovie as well as the solution on how to successfully import MOV into iMovie. iMovie only supports the MOV movie file whose video codec is DV, MPEG-2, MPEG-4, H.264, or AIC. If a .mov video contains an incompatible video codec, the file will either not import into iMovie or will exhibit playback issues after import. In this case, you may need to convert the video file to iMovie compatible video format. 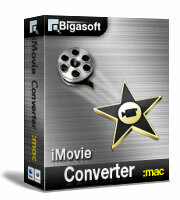 Bigasoft iMovie Converter is just the ideal MOV to iMovie conversion tool. It is especially designed to convert MOV (with incompatible video codec) to MP4 for fast import to iMovie on Mac OS X. Besides, it also convert other movie clips in AVI, MOD, TOD, MTS, M2TS, DivX, Xvid, ASF, WMV, MKV, MPEG, RM, RMVB, VOB, 3GP, FLV, AVCHD, MP4, H.264, and more to an iMovie friendly MP4 format with great output quality. 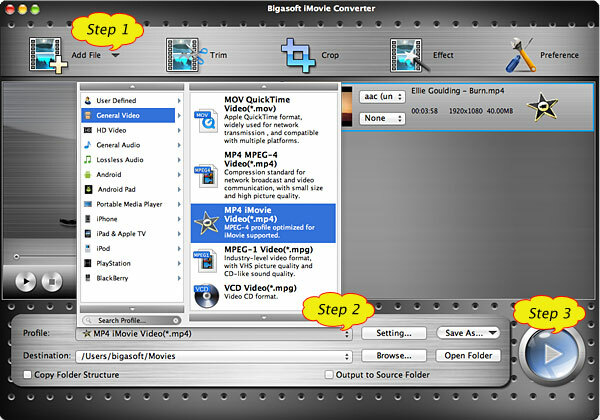 The following will introduce a step by step guide on how to import MOV to iMovie with the help of Bigasoft iMovie Converter. Free download Bigasoft iMovie Converter for Mac, install and run it, the following interface will pop up. 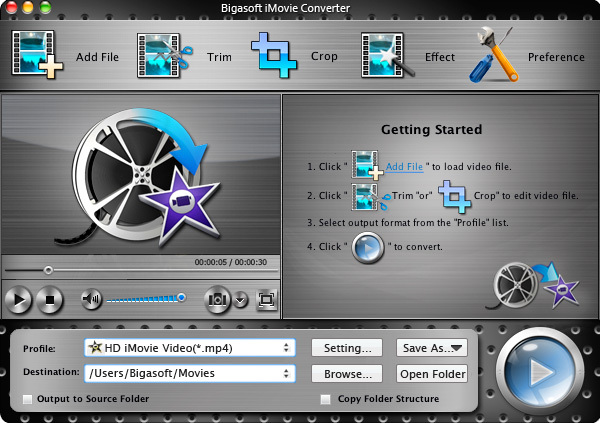 Drag and drop your MOV movie to the main interface of Bigasoft iMovie Converter. Or click "Add File" button to import your MOV video. Click the drop-down button on the right side of the "Profile" button to select iMovie Video MPEG-4 output format from "General Video" category. To import HD MOV files to iMovie, choose MPEG4 HD Video from "HD Video" category. Click "Convert" button to finish the MOV to iMovie conversion. When the conversion is done, click "Open Folder" button to import and add files to iMovie. First start iMovie, then choose File > Import > Movies..., to import MOV into iMovie. It is just easy to solve iMovie cannot import MOV issue with the help of the powerful MOV to iMovie Converter! Why not free download it to import MOV to iMovie to have a free try?